k.k used the bolts on the variant. Why not have unrivet? OK NewAge go for it. You have been in Patagonia? Then the only junk bolts are Maestri's and you can peacefully use all the others and still get it "by fair means"??? sono nuovo del forum, arrampico da 25 anni e sono stato in patagonia un po' di volte... spero di trovare qui degli amici che abbiano la mia stessa passione e con cui magari condividere delle belle esperienze in montagna. Ho visto tante belle foto, complimenti! Everyone still posting (including me) is simply proving John Long's point--the deed's been done, the future is here, and we're all just sitting on the sideline yapping about what yesterday was all about. That route is gone--no more free rides to the summit of Cerro Torre. Toughen up, redirect your dreams elsewhere, or remain a sideliner. Better yet, create something new somewhere yourself. The previous post says the following. 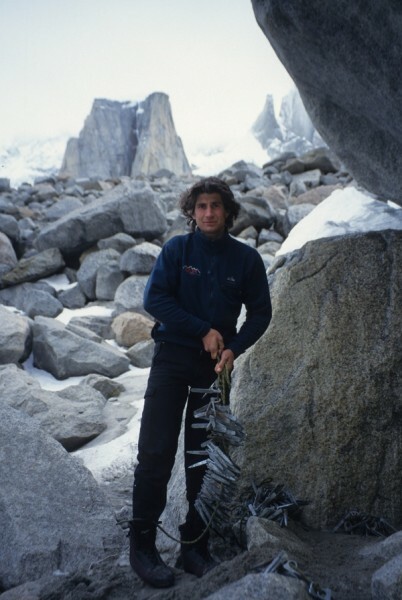 are new to the forum, climb for 25 years and I was in Patagonia some 'times ... I hope to find friends here who have my same passion with which you may share some good experiences in the mountains. I have seen many beautiful photos, congratulations! Cerro Torre lies within Argentina's Parque Nacional de los Glaciares, also a UNESCO World Heritage site. This World Heritage site is called Los Glaciares, and it meets the criteria of a natural, not a cultural, UNESCO site. There are official criteria. While the selection committee determined that the area contains "superlative natural phenomena or areas of exceptional natural beauty and aesthetic importance" and "are outstanding examples representing major stages of earth's history, including the record of life, significant on-going geological processes in the development of landforms, or significant geomorphic or physiographic features", they didn't consider the Compressor Route "to represent a masterpiece of human creative genius", although many folks in this thread have made just that comparison. "World Heritage is the designation for places on Earth that are of outstanding universal value to humanity and as such, have been inscribed on the World Heritage List to be protected for future generations to appreciate and enjoy." "It is based on the premise that certain places on Earth are of outstanding universal value and should therefore form part of the common heritage of mankind... While fully respecting the national sovereignty, and without prejudice to property rights provided by national legislation, the States Parties recognize that the protection of the World Heritage is the duty of the international community as a whole." "187 countries (called States Parties) have ratified the Convention, making it an almost universally accepted set of principles and framework of action." Since when does one get credit for a route that they didn't finish? Sure CM did the heavy lifting, but he bailed before the top. Therefore a historical failure of epic proportions, not a route. Uh, The Larry is right here! We've all been wrong for decades. From now on, let's call it the Bridwell Route. So, K&K have chopped the Bridwell Route. Nice effort and good on you Rampik. Thanks Mike--Good to see you're still living the dream. Why K.K. have not taken the compressor? Do you know where the compressor? The Compressor truly belongs in a museum somewhere. It's a climbing relic right up there with the Dolt Cart. Maybe they could bring the Dolt cart out of retirement to get the compressor down. Now that would be cool. Who is going to carry it down? If it ever comes down I think it well be a 5000ft tumble down to the glacier.